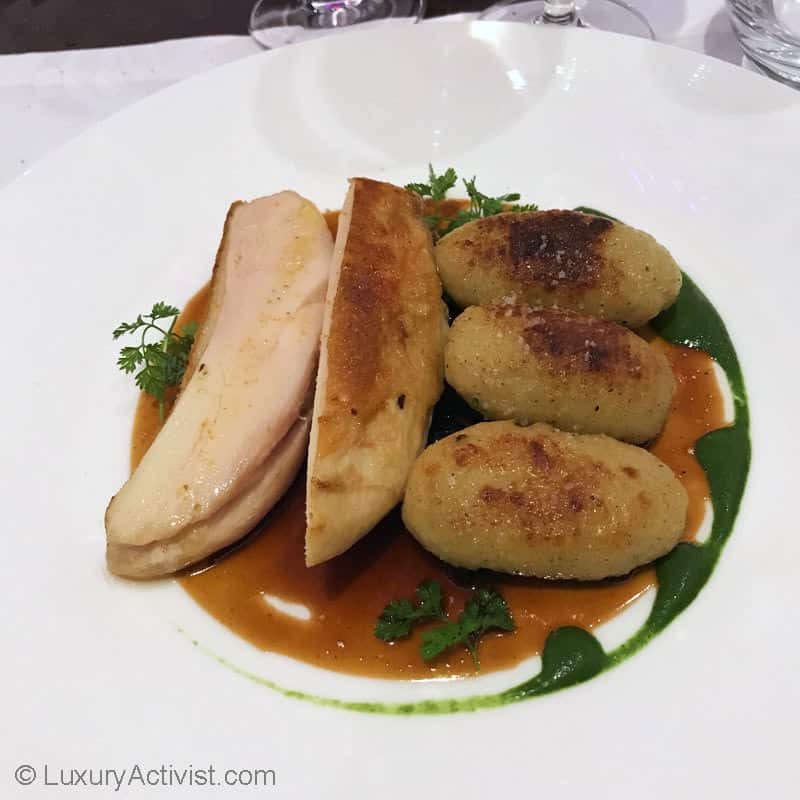 This week, we were lucky to discover the new seasonal menu of the Brasserie du Royal at the Royal Savoy in Lausanne. This is probable one of our preferred restaurants in town. 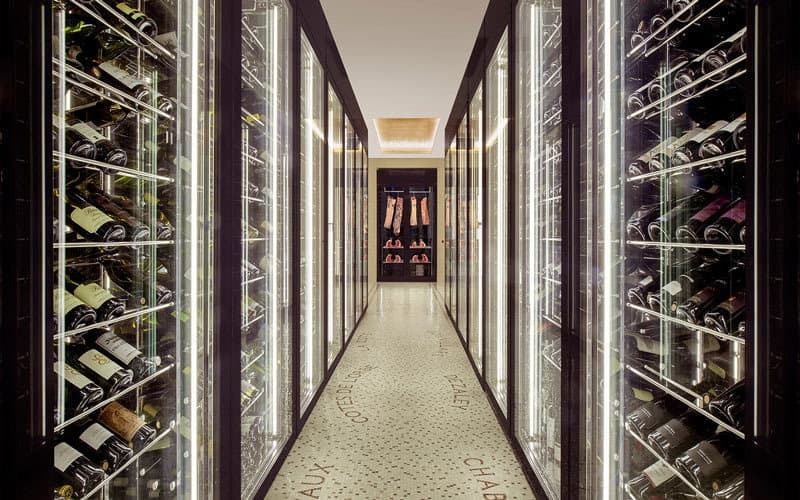 The expertise of the Alsatian triple Michelin-starred Chef Marc Haeberlin, complements the skills and experience of the Executive Chef Julien Krauss and the Brasserie team, allowing foodies to discover and enjoy distinctive and creative Brasserie food. Alain Kropf, the Royal Savoy Lausanne General Manager, explained that Simplicity is the ultimate form of elegance and luxury. This is why Marc Haeberlin was chosen to bring his expertise to the Brasserie. 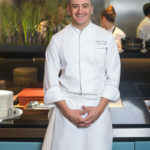 His approach of food requires the highest standards in terms of quality and the very good taste for simple ingredients. This is the heart of the Brasserie du Royal. Originally from Alsace region, Julien Krauss started his career among the stars of gastronomy. First at the Vieux Couvent in Alsace, then at the Auberge de la Charme in Dijon and then from 2006 to 2008 at the Auberge de l’Ill in Illhaeusern, the restaurant of the Haeberlin family. All these restaurants have stars in the famous Michelin guide. Julien Krauss learned the love for good quality ingredients, play with seasons and origins and above all, the respect of the customer. His approach of Cuisine is very client focus. He will not hesitate to change the way things are done if he believes will procure a good benefit for the experience customers would have. 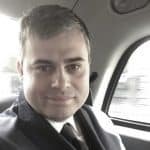 There is, as mentioned here above, a natural connection with Marc Haeberlin which makes from this collaboration a fantastic dynamic duo. 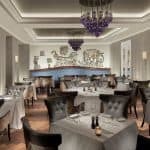 What is special about the Brasserie du Royal? 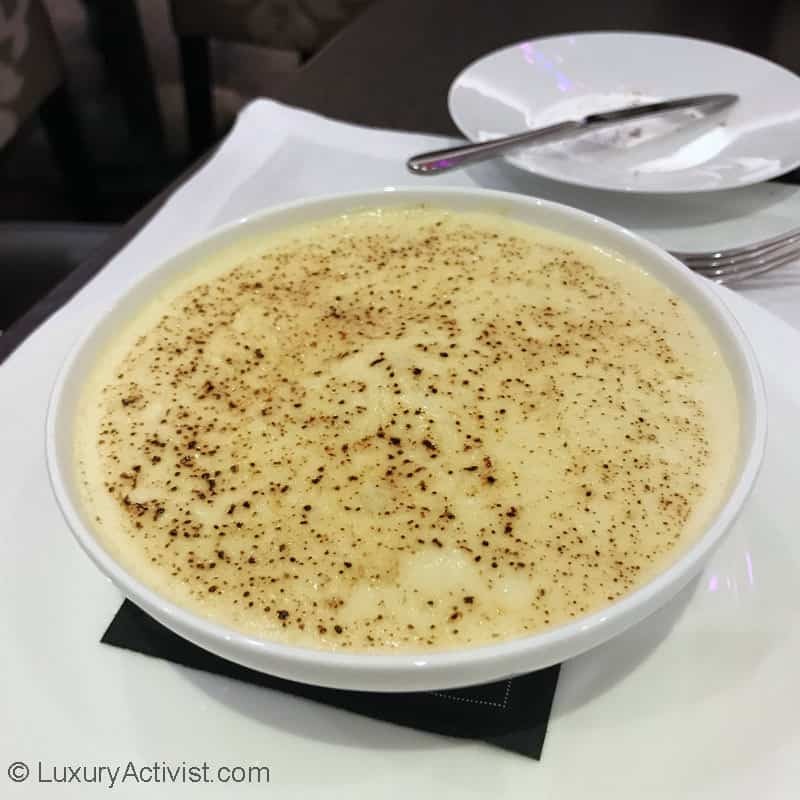 Being in the heart of a five stars hotel, the Brasserie du Royal benefits from a luxury clientele, who generally have high expectations standards in terms of quality and service. This allows a great freedom to innovate, to surprise and to please customers with a great experience. The first thing we see is the caring that all the Brasserie personnel brings to their customers. You feel welcome and you know by the smile of the waiter that you are going to spend a good moment. Then, let’s not forget the true spirit of a Brasserie. Originally from France, a Brasserie is a type of restaurant with a relaxing setting which serves single dishes and other meals. The word itself is a french word for “brewery” and by extension the “brewing business”. 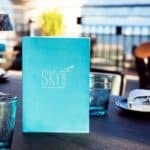 A brasserie can be expected to have professional service, printed menus and traditionally white linen on the tables. The food is generally supposed to be of very good quality and simple as for a everyday meal. 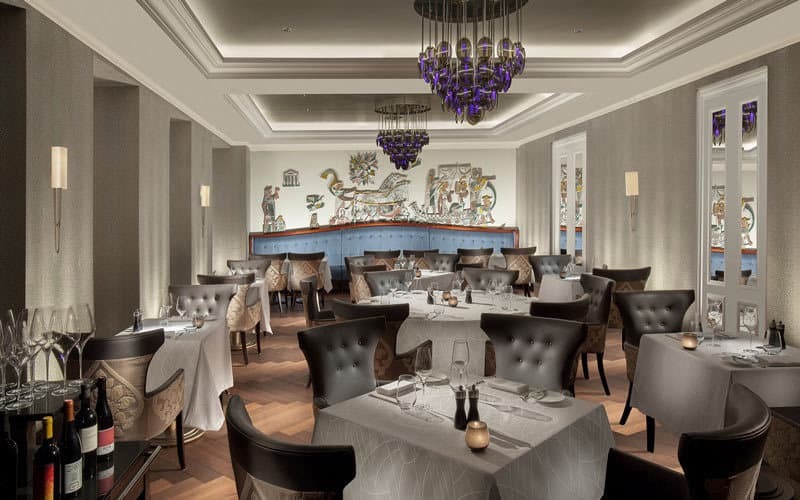 At the Royal Savoy Lausanne, the spirit of Brasserie is well respected. No matter if you come for lunch or for diner, you will enjoy a delightful moment. This was the perfect starter. This revisit of the “Oeuf Florentine” is a success. In the culinary arts, the word Florentine, or the term à la Florentine, refers to a recipe that is prepared in the style of the Italian region of Florence. The easiest way to remember what it means is that a Florentine-style recipe features spinach. The Brasserie du Royal revisit this recipe. Each spoon is a carnival inside your mouth. To note the small pieces of cheese… hummm. Here is the perfect illustration of a simple, elegant and tasty dish Brasserie style. 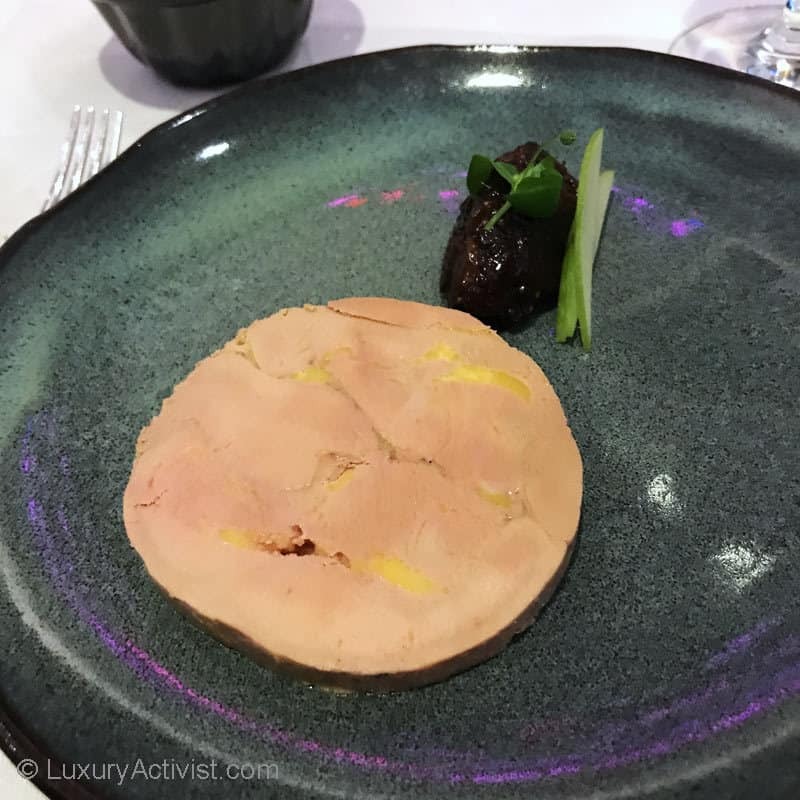 The foie gras H is beautiful prepared. Very tasty. It is served with a elegant dried fruits chutney and a surprising revisit of the Alsatian kougelhopf. The kougelhopf, or Gugelhupf, was traditionally baked in a distinctive circular bundt mold. In late medieval central Europe, it was served at major community events such as weddings. There are many regional variations, testifying to the widespread popularity of the kougelhopf tradition. For us, this original dish could be described as East-meets-West. 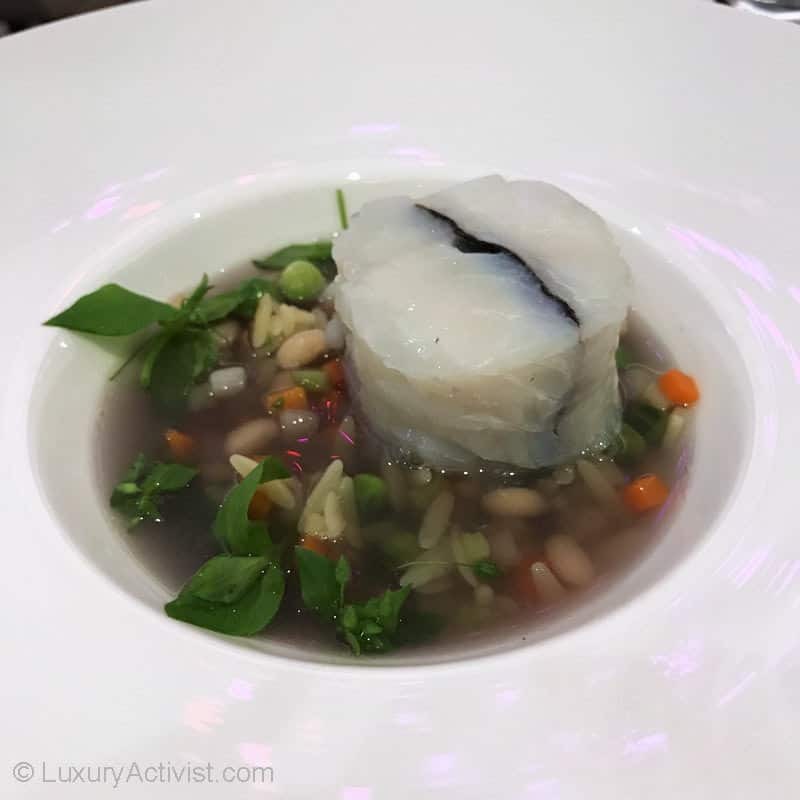 The minestrone idea associated with the fish, its algae and its exotic bouillon present a rich picture and a delight for the palate. Very delicate. Another great example of a simple dish but prepared with the best qualitative ingredients and in the right way. This slow-cooked chicken was probably one of the best chicken I had for a long time. It was perfectly cooked and still, keeping its juice and flavor. The gnocchi potatoes associated with the mushrooms was generous and mouthwatering. Last but not least, the touch of “ail des Ours”, the green sauce around, brought the perfect hint of originality and loyalty to the Swiss terroir. In a true brasserie, there are desserts you need to have. 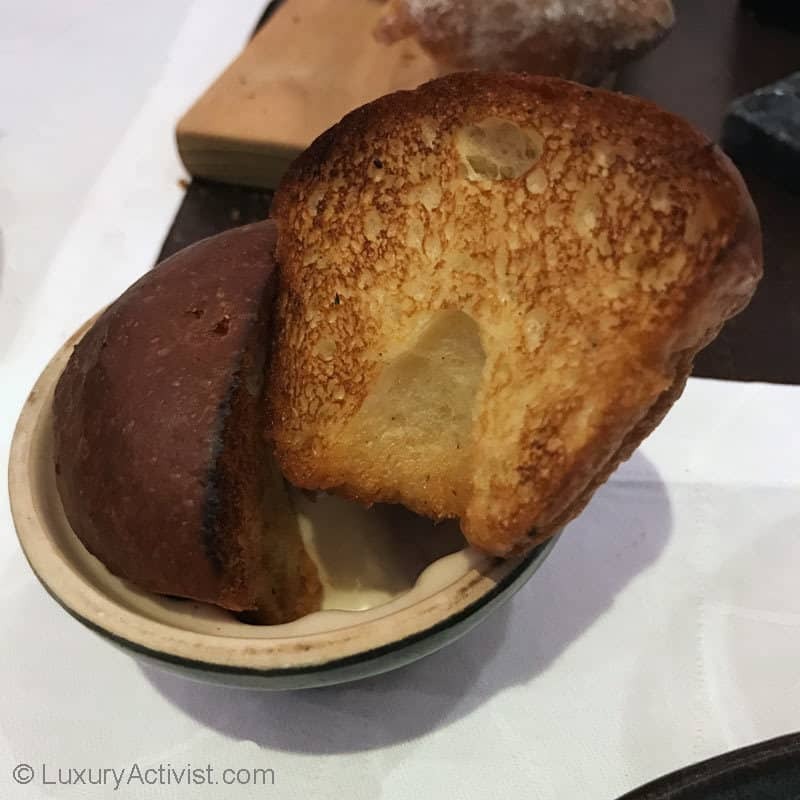 From Baba au Rhum, to Tarte Tatin, there are icons you need or then you are not a brasserie. At the Royal Savoy Lausanne, you will find these amazing sweet traditions but even more. Here the example of the iconic Haeberlin Peach. This recipe is a true family recipe created by Paul Haeberlin in 1965. Since then, it had a special place in the Haeberlin family and became a signature dessert. 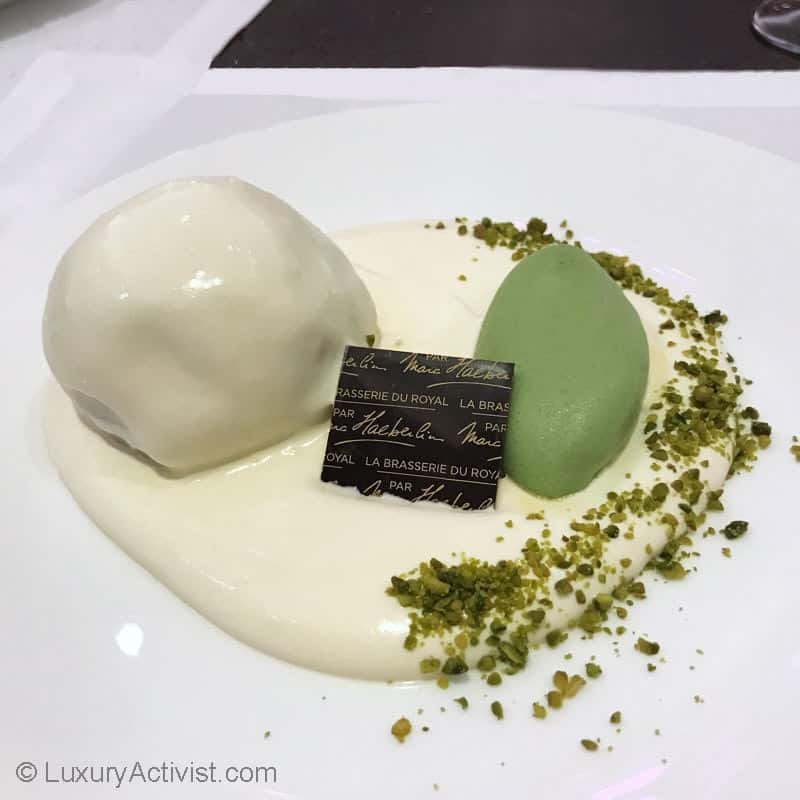 At the Brasserie du Royal, you can taste this dessert which is a thrill. 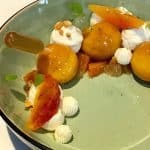 The Sabayon is delicious and this entire poached peach is outstanding. No better way to finish our meal. Once more it was a great pleasure to get back to the Royal Savoy in Lausanne. The Brasserie innovates and yet, is still truthful to the brasserie spirit: simplicity, elegance, quality and good caring of its customers. 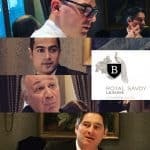 Info sourced at the Royal Savoy Lausanne and diner experience. All content is copyrighted with no reproduction rights available. Images are for illustration purposes only. 3 New Desserts at the Lausanne Royal Savoy – New Menu.